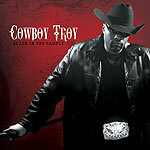 CD review: "Black in the Saddle"
Probably better-known for his TV gig co-hosting reality show "Nashville Star" with Wynonna and Jewel than for his innovative melding of country and hip-hop, "Cowboy" Troy Coleman makes the leap from novelty act to A-list talent on his second album, "Black in the Saddle." Troy is creating an all-American fusion of urban and rural, city and country traditions. He calls it "hick hop," but it's as fully realized a vision of a new hybrid as what Miles Davis did for jazz and rap with his final album, "doo-bop." More impressive in many ways, too, because while both jazz and rap draw on a shared wellspring of black musical traditions, melding country and rap is a more challenging endeavor. But in Troy's hands as represented on his new album, it comes off as utterly organic, as completely natural, as something that was there all along just waiting to be discovered. It's equal parts country, rap and mainstream rock, Kid Rock with both more country and more rap. Rapping about line dancing and long-neck beers and the Grand Ol Opry, rapping over banjo, fiddle and mandolin  well, truth is, we've not heard anything like this before. And his ability to rap to a decidedly country-western rhythm structure shows an imaginative approach to the music. The opening track, "Buffalo Stampede," is the most likely hit of the 10 new songs on "Black in the Saddle": rap, country and even a little hard rock guitar. On the fourth track, "Take Your Best Shot Now," the synthesis of black urban music and white rural traditions is at its most seamless. A new mix of his 2005 hit, "I Play Chicken With the Train," is even more uptempo and danceable than the original. "How Can You Hate Me?" is an in-your-face shot at racism, and "Hick Chicks" is a playful paean to country girls. Rap purists are complaining that Cowboy Troy raps like early 1980s rappers, that he's not authentic in his street cred  but for country and other non-rap fans, that may be the best approach. It's not a fully chanted approach to rapping  it's a cross between rapping and singing that is easier for folks who aren't into rap yet to wrap their ears around. It's a point Cowboy Troy seems to understand, even if his critics don't: He's an entertainer  and on this second outing, he does a very solid job of doing just that in a way nobody else has done it before.